At a first glance at the box of the FYI VP3 motherboard the bright colors, and cheesy looking artwork make the product look like a child's toy...in reality, the FYI Socket-7 AGP motherboard is far from that. 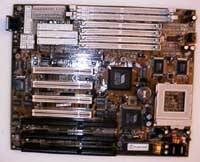 Available in both an AT and an ATX version (the model reviewed here was an AT motherboard) the motherboard itself is quite small, featuring 4 PCI, 3 ISA (1 Shared and 2 of which can accept full length cards) in addition to the 1 AGP slot found on all VP3 based motherboards. Straight out of the box, the 6 page user's manual (if you can call it that) fully discloses every single bus speed setting available on the FYI motherboard, a bold statement from a company that has nothing to lose, no tight relationship to Intel, and no problems with informing their customers on how to overclock their motherboards. The box of the FYI board does indicate a possible 100MHz bus speed setting, however on the test motherboard used here the highest achievable setting was 83MHz, which is higher than any previously achieved bus speed for a VP3 board on this site (since this motherboard was received a number of companies have announced VP3 motherboards with support for the 83MHz bus speed, Tyan in particular has announced that their Trinity VP3 board will support this setting). The FYI VP3 board appears to be well designed, making excellent use of the notebook paper sized PCB (Printed Circuit Board) it is built on. The AT version does have support for both AT and ATX Power Supplies, and naturally allows the user to switch between the two Power Sources using a single jumper on the motherboard rather than a BIOS setting. The Floppy, Serial, and IDE connectors on board are all framed connectors (they have borders around the sets of pins to ensure that you can only stick the cable in one way provided that the cable does have a notch on one side). That is an interesting thing to note since most motherboards aimed at a low cost market are manufactured without the frames much less the support for dual power supplies in order to cut down on production fees, each extra component a manufacturer chooses to put on their motherboard drives the cost of production up even more. Judging by the VIA chipset on the motherboard it is obvious to any user that has had experience with VP3 boards that the FYI is in fact a genuine VP3 motherboard and not an imitation like some of the old VXPro and TXPro motherboards were being sold as. The board does use a switching voltage regulator, and supports CPU core voltages from 2.0v up to 3.5v in 0.1v increments making this another possible candidate for the AMD K6/266 when it does make its way into the retail channels. Unlike the DFI VP3 motherboard that was extremely stable at the 66MHz bus speed but lagged behind the competition in stability when clocked that the 75MHz bus speed setting, the FYI VP3 board had no problems at the 66, 75, or 83MHz bus speeds even using the most aggressive BIOS memory timings. Performance at all overclocked speeds was comparable to that of many high performing (and high priced for that matter) Intel TX based motherboards without the Intel logo on the chipset. Attention 6x86MX users...the manual for the FYI board states that jumper J6 allows you to enable/disable Linear Burst Mode, which when used with a supported processor (i.e. the Cyrix 6x86/6x86MX) does yield a 1 - 2.5% increase in performance, not bad considering you don't spend any extra to achieve that performance increase. Why is this feature listed under the Bad section of the FYI VP3 Review? Well, the motherboard tested here didn't have a J6 jumper, it was hammered down in the off position at the factory, as if that weren't enough the system itself wouldn't boot with a 6x86MX installed, regardless of the setting used. Therefore, if you're a 6x86MX user the FYI VP3 is probably not the motherboard for you, not to say that all of the FYI VP3 boards won't work with Cyrix processors, just be aware of the possibility. The 6 page user's manual. That is all that needs to be said, a 6 page user's manual which does nothing more than place all the information already printed on the motherboard in a tiny booklet you can keep at your side for easy access, a very large step back from the excellent manuals found with ABIT, ASUS and AOpen motherboards to name a few. The installation of the AT motherboard can be a bit of a pain, the voltage jumper settings are especially difficult to access from virtually any angle without the aid of a trusty pair of needle nose pliers and a touch of patience, don't expect to be able to switch settings on the fly with this board, bottom line, the FYI VP3 is as close as one can get to the absolute converse of a Jumperless Motherboard.